To this day I have not found a better diy electric bicycle conversion with all the benefits of this one. It doesn’t damage or alter the bike itself in any way, it’s easily removed or transferred to other bikes, and it costs virtually nothing compared to the commercial kits and hub motors. It’s also fairly capable considering its simplicity. See latest post HERE. For starters, you will need a bicycle, preferably with lockable front suspension (if any) and enough room on the front fork tube for two 1.75″ or 1.5″ by 1/4″ U-bolts and your (replacement) motor for a Razor E300 scooter (~$30). You will also need a 8mm (ideally), 5/16″ , 3/8″, 1/2″, or 5/8″(larger ones with spacers) motor arbor adapter, an old skateboard wheel, and a little bit of ingenuity to complete the drive system. A small strip of non-slip grit tape on the drive wheel will ensure traction in wet weather. Almost everything with the exception of the arbor and U-bolts can be found on an old or damaged Razor E300 scooter. On my motor, the four mounting holes were measured to be about 92mm by 42mm apart. Also, I had to file a tiny bit off the outer curve of one U-bolt to get it to fit into a tight spot without any unnecessary stress on the front fork assembly. Most Trek Mountain bikes should accept this bracket without modification. The two I tested were the Trek 4-Series and the Trek 4300. I also strongly suggest you stuff a piece of rubber or non-slip alternative between the U-bolts and fork tube. This will prevent the motor from falling out of alignment and loosing grip with the front tire. You will want to deflate the front tire briefly in order to get the motor alined and locked into place. You don’t want too much pressure between the drive wheel and front tire, otherwise you will loose efficiency and cause excessive stress on the motor shaft and its bearings. Your motor arbor adapter should already be installed on the motor and skateboard wheel. You will want this mounted firmly with as little rotational wobble as possible. Hack in some spacers if you are using a larger arbor. This will reduce any unnecessary vibration or fatigue on the motor. Alternatively, you may need to consider getting creative with some two-part epoxy. In my first iteration of this e-bike, I simply epoxied a skateboard wheel to the motor shaft, nut, and sprocket directly. This worked for a little while, but soon the bond between the epoxy and polyurethane wheel broke and caused the two to spin freely of each other. I also couldn’t get the drive wheel to run in the middle of the tire due to the motor shaft’s length. For a quieter ride, I suggest you use hybrid tires on your bike (if applicable). These have a smooth center strip which increases traction on both roads and the main drive wheel. Once you have the motor installed, it’s time to get the electronics in order. For this you will need your (replacement) “control module” and throttle handle from the Razor E300 scooter (~$30). You will also need to find two 12v 7 to 10Ah SLA batteries capable of supplying enough current for this system. Finally, you will need a case or tool bag to put everything in and a way to mount it to your bike. I used a generic tool bag strapped to a bent open cup holder to hold all my electronics for this project. On my previous smaller bike, it was mounted to the rear luggage rack (seen below). An early picture from the archives. Once you get everything securely nestled into the tool bag or box, you will need to mount it to your bike somehow. On small bikes you may need to simply strap it to a rear seat-mount rack/carrier as seen below. On larger bikes, a modified (bent open) cup holder mounted in the center of the frame will do just fine. This is what I use today. The last step is to mount the throttle handle and route the remaining wiring along the bike’s frame. Make sure to leave enough slack between the front fork and frame to facilitate unrestricted movement of the handlebars. After a few hours of charging you should be good to go! If the performance does not meet your expectations, try altering the size of the motor’s drive (skateboard) wheel or investing in larger, more capable batteries. If you run into a problem, it is up to you to use your creativity and ingenuity to solve it. If your bike does not fit this motor, or you don’t have access to Razor scooter parts, use the ideas presented here to come up with your own design. Then share it with the world so others can make or build upon it. I saw your DIY electric motorized bicycle and think that it is amazing! I would like to make one for myself! The first question is, is the this motorized bicycle powerful enough to travel uphill? And also, may I know what will happy to the motor once the battery runs out? Like is the motor loose or fixated after the the battery runs out? Am I still able to paddle the bicycle with when the battery is flat or is the front wheel unable to move as well? Yes, this particular setup will pull a rider up most residential hills. I’d still give it some help by peddling. Also, when the battery runs flat, the motor will still be able to freewheel just fine. pls bare with me with those few clarifications, it’s obvious that u prepare your motorized bike by taking off and dissembled a scooter runner. secondly u attach the motor with the concerned bike at the suspension arm which will cause unsustainable motor wheel fixations. does the same motor can recharge back the battery during the use of bike paddles ? This motor and controller combination can not charge the batteries when pedaling or coasting. I’m having a hard time with the arbor bushing any pics on how you did it ? Sorry, I don’t have any pics of the bushing spacer. I do recall using the sleeve/spacer that came with the motor that was placed between it and the sprocket. I cut it in two or three pieces so the 3/8in arbor would fit. I have a question. When the motor freewheels, doesn’t it affect the batteries due to the motor acting as a generator? Nope. The motor controller is not capable or regenerative braking. And a 2way switch to charge or discharge the battery. It sounds like you’re on the right track, but there’s no hills here in South Florida 😛 . The brushed motor I’m using is not very efficient either; even less so when used as a dynamo. Though quite robust as is, the current hardware I’m using is borderline archaic. When I build my next EV (Bike/long board/car/etc. ), I will most certainly be using a hobby-grade brusheless motor and ESC. Many of these can be programmed for regen braking right out of the box. Hi Mike. I just saw this on youtube and wondering how you got the skateboard wheel mounted to the motor shaft, any picture on this ? Sorry, not mechanically inclined but I do want to convert my bike as I often use it to go to work and I think this is a great option for me. Mahalo ! Hi, I used a motor arbor. These are commonly sold as extensions for bench-top buffing or grinding wheels. Find one that most closely matches the size of your bare motor shaft (You may need to make a little spacer if it is too big). It will attach to to the motor with a couple set screws, and the skateboard wheel will be clamped to it between two washers and a nut. The diameter of the skateboard wheel will have an affect on the torque placed on the motor and the rpm of the bicycle wheel. I expect you could play with size to find a ratio that fits your body weight and riding style. Where do I buy this electronic device in my country southafrika? In SouthAfrica we behind 20years. Thanks Mike! I am going to try this at home with my beach cruiser! Hey, by the way, are all skateboard wheels adaptable to the motor? Or did you have to do some modifications to the rubber wheel itself? I don’t have an old skateboard wheel, so I am going to have to look in to getting one from my local shop around town. Great demo vids man! Thanks again! Thanks, you are first going to need to find a motor arbor like THIS. These will clamp tightly on to any wheel you give it. They also have a couple setscrews that secure them to any motor’s shaft. Make sure you get one that is appropriately sized for your motor’s shaft though, otherwise you will get some bad vibrations. Actually, if your wood skills are any good, instead of looking for an old skateboard wheel, you might be able to make a drive wheel out of some old hard wood. This is just a thought, but there could be some additional benefits here. I’m not sure if my amazon searches match yours, but I get dozens of results for “razor e300 motor”. If amazon doesn’t work for you, try eBay or your local scooter repair store. Where I can by that items? You can get the parts from a number of stores online. Just do a Google search for “Razor E300 motor”, “Razor E300 controller” (may or may not come with throttle grip), etc.. Amazon, Ebay, and most scooter parts stores will carry what you need. The motor and controller each may cost around $30-$40 USD. The batteries may be a bit more. can you show me how you wired up the batteries and controller? I have 1 question, does the battery, and the throttle grip the only 2 things that connect to the controller? I plan on making my own this came out very nice and and it is a simple design. The controller requires power (batteries) and a throttle input (twist grip). The controller also has one output that goes directly to the motor. It’s the same with all electric scooters, and their schematics are available elsewhere online. The biggest question that many have, I for one, is what’s up with the wiring. Can you make video or post pictures about the wiring and the on/off switch? This is the only thing that’s holding me back from making this project. This is the best DIY ebike project I’ve seen so far. Thanks for the info and after seeing some videos I’m ready to put it together. No, I shorted out the pins with a piece of wire. Is it possible to charge the batteries? If it is, could you recommend me the charger? Thank you, it would help and mean a lot if you can get back to me! My scooter came with a dedicated 24v charger. SLA batteries re pretty forgiving in this sense. Any 24v SLA battery charger will do. Would ones with alligator clips work fine? Will it work if I dont have the brake wiring thing. Like if I dont have a brake at all? As in theres nothing connected to the section on the control module for the break. Will it still work? How did you connect the batteries to the controller? Is the Motor arbor adapter the Eazypower 81042 Motor Arbor Adaptor off of Amazon? It should work, but you will need to make a spacer to fit around the motor shaft to increase its diameter, like I did. If you can find a 5/16″ arbor of the same type, that would be nearly perfect. So would I need the spacer if it get the 5/16″ arbor? No. The shaft on the end of a Razor E300 motor is exactly 8mm. 5/16in is actually 7.9375, so you would need to actually bore it out a bit with a drill bit. Back in 2008, I couldn’t find anything close to that, so I used a 1/2″ arbor with a spacer made from two half-circles of copper pipe I think (cut with Dremel). Edit: And the reason you need a spacer for larger arbors is to ensure the arbor and drive wheel spin true with negligible vibration. I just ordered the razor e300 motor, a 12v 10ah sla battery, and the razor controller and throttle from Amazon for roughly $110. I have a Marin bay view trail mountain bike which doesn’t have locking suspension so I am planning on some how making a rear wheel drive. I will post after I am finished on how it turned out. Awesome, can’t wait to see it! But keep in mind, the Razor E300 was a 24v system, which means it needs TWO identical 12v SLA batteries. Thanks! I was having trouble with the wiring and was wondering why it wasn’t working… I’ll have to order another battery. I post if I get everything working. Ok so the wiring is all working but I’m going to have to weld some sort of rack on the back of the bike and I will mount the motor upside down on that. Also, I’m making my own sort of “motor arbor” instead of buying one online. I keep posting on my projects progress and maybe a link to some photos when it’s done so others could reference them. How do you actually build the motor? Do you have any video of that or if not can you make a video of that? The motor is actually a $30 replacement motor for the Razor E300 scooter. I just removed the included/bolted-on sprocket and slid on an arbor that clamps down tight to the motor’s shaft with a couple screws. I will not make a video for this. You can take a closer look at the images for insight. A close-up is also included in the main video. Is the shaft and nut all you need to keep the skatboard wheel in place? Or do you have something else inside the wheel to hold it snug to the shaft? The arbor is being used normally; squeezing the skateboard wheel tight between two washers. I also added some epoxy to prevent anything from loosening over time. However, since my arbor has a 1/2in hole and the motor has a 8mm shaft, I had to fabricate some spacers so everything runs straight without any vibrations. What motor arbor did you use? could you link a website? Any thoughts on incorporating regenerative braking? I’m using an off-the-shelf motor controller from an electric scooter that I had gathering dust. It would not be worth the investment to design or implement regenerative braking. I don’t even think DC brushed motors are that efficient for such a task anyway. Hi Mike, I have an old E scooter also gathering dust,,but it is a 250w running on 2x 12v 7Ah batteries, any idea what the biggest batteries I can use eg,,, 12v/12Ah or what is the most powerful ones I can use without burning out the 250w motor, and lastly what is the biggest motor the controller in the scooter could power, eg could it control 300w or more. ,,,,,Thanks a million for the idea, and for sharing it. Kindest Regards,,,,James. If your 24v scooter is rated for 250watts, that means it will draw a maximum of 10.4Amps (less if coasting or lower throttle) at 24volts. 10.4a * 24v = 250w. The Ah or Amp-Hours rating is a term generally used to describe a battery’s useable capacity, not its max output current. Think of it as the amount of hours the battery will last if you draw one amp from it. As long as any battery you choose to use can supply at least 10.4amps, you’ll be good. Larger Ah ratings will only increase your range at the cost of weight. I.e. When you have 2x 12v 7Ah SLA batteries in series, you get a 24v 7Ah pack. With a 250w scooter, this will probably give you, lets say, about a 10 mile range. If you upgrade to a 24v 14Ah pack (2x 12v 14Ah SLAs), your range would nearly double to 20 miles! Though, so would your weight. Not much else would have an effect. Wouldn’t it be possible to mount the motor on the rail of the seat? So it would be possible to lift the seat a few milimeters to detatch the motor from the bike wheel. I’m sure it’s possible, but you would have to devise a way to transfer mechanical power from the motor shaft to the rear wheel. Some assortment of steel brackets might do it. Give it a shot. You really shouldn’t need to detach the motor at any time though. With the motor, controller, and hybrid tires (smooth, treadles strip in the center) I use, the friction everything adds to a standard unassisted ride is negligible. Thank you so much for posting your project and showing us how to do it. I definitely want to add this upgrade onto my bike. The price to pay for already built systems and even add on systems is ridiculous! 300-8,000$! I live in Vegas so everything I need is pretty close by so I hope to use this soon! If you have any new updates/pics I’d love to see some! Great! That’s good to hear! I just recently hacked some large-ish light weight LiPo batteries into my setup to see how it runs. The results were pretty decent and I’ll be posting the video on this blog in just a few hours hopefully. Keep us updated on your build! I dont understand how you would connect everything together? Where do you get all the plugs ? Or do you just use wire and twist them together? If I ever twist two or more wires together, I’ll always solder and heat-shrink them for a more secure and reliable bond. Adding plugs only makes everything convenient to maintain. I use mostly XT60 connectors which can carry a lot of current without heating up or failing. They also prevent you from plugging anything in backwards. You can find them at almost any RC/hobby store or on HobbyKing. There are also plenty of graphical schematics and wiring diagrams for scooters of all types online. If you can find the right one, it’s as simple as playing connect the dots. I like your invention and I want to invent one as well as for my need to go to school. Do you think using the motor from a table fan work? a fan motor comes with the arbor, controller and power cable attached. my fan is 110V 30W. Do you think it is capable of moving my bike’s wheel? And also I do not know how to do on the battery part. If I get a YUASA battery (http://thebatteryshop.co.uk/np7-12-yuasa-12v-7ah-lead-acid-battery-306-p.asp ) will it work? Main problem is I do not know how to connect the cable. Please help. A 30W table fan motor will not power a motorized bicycled. Not only would you need to find a 110v power source (12v battery won’t work), 30 watts of power can’t do very much at all in this scale. You would need at least 150-300W to push a person at a reasonable speed. Also, that battery you linked is listed as a “Standby battery” which is not well suited for the high current draw of an electric vehicle. It may work, ust not very well or for very long. Finally, depending on how fast I ride, the two 12v 10Ah SLA batteries I have on my bike will help push me along for around 10 miles on a full charge. After that I can simply pedal without use of the motor. Brilliant design, just what I was looking for. I really appreciate the way you are actively involved in the ongoing discussions with those who are also interested. Everything makes sense, and I can totally do all this. The only thing I can’t determine is how to decide what is a good 12v 10Ah SLA battery to use? In the comments you have mentioned not using batteries designed for UPS or emergency lights, since they are not designed for the draw they will experience. Looking throgh amazon.ca there are hundreds of 12v 10Ah SLA batteries available, what criteria can I use to narrow it down to the ones that will not melt on me? Thanks. I’m not sure how Amazon localizes it’s results by country, but you might want to try searching for something along the lines of “12v scooter SLA” and see what comes up. Generally speaking if a listing states that the battery is a suitable replacement for some form of electric scooter, then you might be able to safely assume it can handle the current required in an e-bike (12.5A max for a 300w, 24v system). If you can give up a couple miles on range, sometimes you’ll find that 7Ah to 9Ah SLAs are a little more common and easier on your wallet. The main idea is great, especially since this is a low-budget enhancement. 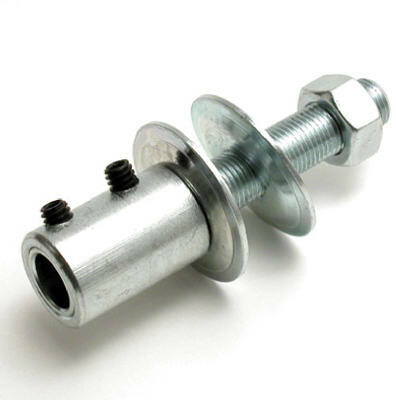 But as a future improvment if i may suggest: install a springed fastener with which you can set the proper pressure between the wheel on the engine and the wheel of the bike, to avoid unnecessary tyre wear. It needs like a long bolt, a strong spring, and a few metal plates, and practically a big winged nut, to set the pressure up. With this solution, you can even set your wheel free if electric help is not required + Move it to the back tire, and you will set your front suspension free. I appreciate your feedback, and thanks for the insight, but the idea hear was simplicity. It only takes about five minutes to remove or reinstall the entire electronics package; motor, batteries and all. The motor also freewheels nicely, so there is no immediate need to remove it if the batteries go flat. Also, in the seven or so years I’ve had this setup (five years on current bike), I have yet to perceive any uneven tire wear between the front (drive) and rear tires. A free suspension may sound nice too, but I find that such a feature is usually not encouraged on paved ground (you actually loose energy to bobbing as you peddle). Hello Mr Mike…thanks for the information…good stuff. Actually the size of the bicycle wheels has no effect on the speed or torque provided by a secondary friction-drive wheel. The only factors for such friction-drive systems is the size of the drive wheel on the motor and the speed/torque of the motor. The size of a bicycle wheel only comes into play if you are driving said wheel from its axle (i.e. pedaling, or using a hub motor). Finally, I’m not entirely sure about Lithium ion battery use in something like this. I know they don’t deliver as much current as Lithium polymer, but they are a bit cheaper. As long as you find a LiIon capable of delivering enough current, I’m sure it’ll work. Hi do you think the razor would mount to a rear bike rack ? I’m note sure. It depends what bike and rear bike rack you have. I’m sure you can make it fit in some way or another. I’ve spent the past few days looking for cheap e bike kits, dodgy home brews using power steering motors etc etc. I’ve been looking for a way to do this on the cheap using some easily accessible components. I figure with the amount of electric crap we have available to us in the form of different appliances there must be a better solution than dropping £300+ on a kit. You hit the nail on the head. Now I know what I need and I can get the project started. I used mostly 12AWG wire for the high current stuff (battery and motor). The size of this conductor makes voltage drop across long cable runs less of an issue. How do I connect the wheel to the motor? I saw a picture that you connect with a particular screw. How did you do it? I used a motor arbor. It has a hole that goes over the shaft of the motor, and a nut that allows you to clamp anything like a skateboard wheel onto it. I am modifying this system to fit a three wheel recumbant bike. What are your thoughts on the following battery ideas? Since weight and space are not a concern how about wiring two battery packs in series for a total of four batteries (or as a simple alternate idea use a double throw switch between them), Would a scooter charger charger charge both battery packs but take twice as long, would multiple battery packs increase or double the range? And if weight is not an issue what about using a pair of deep cycle 12v gel batteries like they use for trolling motors? Much larger batteries , could be charged with any car charger, any thoughts on possible range? Weight can still be an issue, regardless of how many wheels you have. It’ll always affect your acceleration as well as up-hill travel. Also, doubling your pack’s capacity will not exactly double your range for that reason; you may get close, but it won’t necessarily double. With that being said, you might want to consider looking for suppliers of power-wheelchair batteries. You can find 12v SLAs with capacity ratings well above 20Ah, 35Ah, or even 75Ah. Also, cheap SLA scooter chargers might be able to charge larger packs. However, since most cheap chargers are just outputting about 24vdc at a regulated current usually less then an amp, you might want to consider finding a larger 24v SLA charger for faster, more reliable charge times. ps. LiPo batteries are less then half the weight of SLAs of the same capacity. You can get a single 20Ah, 24v LiPo pack that weighs about 3kg (6.6lbs); or a pack of two 12v, 20Ah SLAs that weighs a total of 12.4kg (14lbs). You can’t use an SLA charger on LiPos though. I quite like your concept. Thanks for sharing. One thing I would change though is to use Li-ion battery packs like those used in torches that I can slip into the framework and out of sight. What is your thoughts about that idea? Well, if you didn’t see the follow up post I posted not too long ago, I now use LiPo battery packs (borrowed from my tricopter). They provide much more energy per unit mass then SLAs, but cost quite a bit more for any given capacity. They are also a bit finicky to charge. Also, embedding them in the framework of a conventional bicycle would be quite a hassle, on top of the fact that it would be a pain to replace any cells once they go bad. My goal for this project was for it to be cheap and simple. Regardless, I am still in favor of using LiPo batteries in something like this, but only as long as they are handled properly with balanced charging and discharging techniques. All the parts I used are listed in the write-up above. Some links are even given in the comments here. This whole project was based off an old, junked Razor E300 electric scooter. You can buy new “replacement” parts for the Razor E300 scooter such as the motor, controller, battreries, etc. through various places online. Just google them. You might even find some cheap deals on eBay, or even at a local garage sale. Same goes for the nuts/bolts and motor arbor. I used a 24volt 300watt DC brushed motor. That’s good to hear, thanks. Let us know how it turns out! is it possible/beneficial to mount this system to both front and back wheels? That depends on a lot of things. It’s certainly possible if you have the right tools or bike. However, two motors pretty much doubles your current consumption, giving you a shorter effective range. The only thing that it might benefit is your acceleration. Hey mike, as i was watching and reading comments the double motor idea crossed my mind as well. In my thought process id wire both motors (front and rear) to the throttle, and throw in the 24v lipo batteries in a parallel circuit to double the MaH. Ideally speaking i’d think should double the torque as well, or am i mistaken? Ah and mAh are units of battery capacity, not maximum current draw. With most batteries, including LiPos, the max current they can supply is given as their “C” rating (you can Google it). If the battery and the speed controller can handle the extra load of a second motor, then you may be able to safely assume you will about double your net torque and thus acceleration. Your top speed however will remain relatively unchanged if not a little bit faster. The max range you can travel will also be half of what it was before with the same size battery pack. I have this same motor. It was not very clear how you mounted the skateboard onto the motor shaft. Can you clarify that a bit? Thanks! I used a motor arbor to mount a skateboard wheel to the motor (Google it for pictures). The arbor first clamps to the motor shaft with two or three set screws, and the skateboard wheel is in turn clamped onto the main shaft of the arbor with a nut and two washers. Have you test a brushless motor of hely of 300-400 W? I have not tested any brushless motors on this bike. Brushless motors would however provide much more speed and torque for their size. Excellent planning with that mock up! Think a pair of those would work as well as most anything else? As promised, I made my bike. I’m getting a lot of slippage, it was a bit wet when I tested it. The first time I went out, I didn’t have the wheel lined up well with the skateboard wheel. So I adjusted it but didn’t deflate the tyre. Can you have a look at my setup on my Facebook page. Just look for me and you can see my setup. I don’t have a facebook, so I’m not sure how to find you to check out your build. Try emailing me with the “Get in Touch” button above. I too had slippage with a bare skateboard wheel, especially in wet areas. What I found to work very well was a layer of industrial/marine/outdoor grit tape wrapped around the drive wheel. If you wrap it right (in the same direction it should spin), the tape should last for quite a while. Also, when mounting/aligning your motor and drive wheel, be sure to temporarily deflate your bikes tire all the way to let the drive wheel pres into the rubber a fair bit. See one of the pictures on this page for a reference of how deep it should go. Just to mention it, the motor I ordered from monster scooter parts has a shaft that measures exactly 1/2″. I think the 1/2″ arbor I ordered on ebay will fit with no modifications needed (haven’t gotten it or the skateboard wheel yet). I don’t know if you want to promote specific products here, but if everything fits together with no muss or fuss would you like me to post a link for the motor/controller/throttle kit on monster scooter parts and the motor arbor listing on ebay? I also just ordered a 10ah battery pack with a charger and charger socket for the website mentioned above. Can’t wait to put all this together. One question please. I talked to the support person about the controller and he said I could leave all the unused connections on the controller open (even after I asked him if I should put a jumper wire on them). I see above that you jumped the connections for the brake lever on your controller. I’d trust you as the voice of experience over some phone support guy, so do you think it’s important to jump the brake and other unused controller connections? Great video (I left a comment)! Mounting the motor to the rear bike rack is a great idea and offers quite a few extra benefits like you said. I can’t wait to see the finished project! Keep us posted! I mounted the batteries and controller to the luggage rack in a cheap plastic box. Still haven’t gotten the motor arbor or drive wheel. The batteries, motor and luggage rack add up to about 25 pounds, so I’m hoping for good performance to climb hills. Cranking that extra weight around will be tough if the batteries die. I uploaded a video to YouTube at https://youtu.be/v2dtnP6NGkE. I also mounted to the rear wheel, and it works really nice! I made all things simple as Mike’s idea. Nice job! I saw your video. I might have to feature these rear wheel drives on the main page sometime in the future. Keep it up! I really appreciate your simple and effective idea. What happened to the video? I would like to view it. All the videos are still here. Though, following your comment, I have now embedded the “Suggested motor mounting option” video, rather then just show a link. I meant what happened to Sam Kim’s video 🙂 It says it’s not available. I can’t mount my motor to the front forks like you did, Mike, so I want to see what Sam and Ed did using a rear rack. I see, sorry. It looks like Ed’s videos are all we have at the moment. Hi Sam. Looks like a solid and secure place to mount the motor. After watching your video I rechecked all the possible places I could do that on my frame. It just won’t work for my bike. Hopefully my mounting position on a rear luggage rack will be stable enough. Could you give us some more details on your project? What kind of batteries are you using, and what is the speed / range / hill climbing performance you get from them? I’m using 24v, 10ah Lithum-ion Battery. It is about 1.45 Kg. The dimension is 60*77*200 mm. On a full charge, the bike runs at about 30 Kph for 30Km with my assistance. I haven’t tried battery-only riding, for I have to commute 30 Kilometers with one battery. I recharge the battery at my office to come back home. Hill climbing performance is better than I expected. This DIY ebike helps me a lot!! Nice! My commute is only about 9K to 10K, but the hills are quite steep. Sounds like my 10ah SLA batteries will get me to work and back home with no problem if I help out by pedaling. The batteries alone add up to a total of 6 Kg, so I envy your Lithium ion setup. Nothing is ever easy, is it? Finally got my motor arbor adapter and it isn’t remotely similar to the photo shown on the supplier’s Ebay listing. It only has one set screw, and it was positioned so that it tightened onto the threaded portion of the motor shaft. That caused a very wobbly fit, so, I sawed off the threads on the motor shaft and got a fairly tight and concentric connection to the skateboard wheel. Actually, getting the skateboard wheel attached was the first challenge since the threaded rod was too short to use the supplied large washer. The hole where the wheel bearing would have normally fit was just the right size for a couple of lock washers and the nut, so that wasn’t too hard to fix. Once I had the skateboard wheel finally attached to the motor, I positioned the whole assembly over my rear bike tire and gave the throttle a twist. My concerns about the luggage rack mounting idea were immediately shown to be true. The entire luggage rack has an almost immediate tendency to twist on the seat post and loose the correct alignment with the bike tire. I’m sure I’ll be able to brace the rack to the frame in some way to keep the skateboard wheel in the correct position, but it will take some tinkering. I think I’ve got my problem solved. I attached a notched brace to prevent the luggage rack from twisting on the seat post. It isn’t too pretty, but it seems to work. That still allows me to lift the entire assembly off the bike so I can store it and charge the batteries indoors. Winter is really hard on lead acid batteries. Just need to make a small adjustment to get the skateboard wheel centered on the bike tire and I’ll take it for a test ride. The test ride today was a great success. This setup works great. The only glitch was that the grit tape came off the skateboard wheel at about 4 miles. I got the 3M stuff Home Depot sells that is supposed to be suitable for outdoor use and supposedly has a very aggressive adhesive. Mike, what brand grit tape do you use? handlebar cam of my 2nd test ride. Took on some steep hills. I use an anti-clockwise bolt and nut, which tightens itself when the motor spins. Thank you Sam. Your method for attaching the drive wheel to the motor shaft sounds much different than Mike’s. Since it is self-tightening it also sounds like a very good idea. Could you give us some more details on that please? I put a generous application of heavy duty loctite in the set-screw hole and on the set screw. I was thinking about using epoxy on the shaft and arbor to make it a permanent connection, but decided against it. I’m thinking about upgrading to a 500 watt motor and I might want to use my current 300 watt motor for something else. At least with the loctite you can heat the part to 500 degrees and get the screw out. First, I got ‘MY1016 300W 24V brush motor’ with chain sprocket, which has 11 teeth. Second, I got a skateboard wheel, whose outer diameter is 54mm and inner diameter for bearing is 22mm. Third, I forced the chain sprocket into the inner hole for bearing with rubber hammer. Luckily the sprocket and the bearing hole fit very tight and well. Fourth, I prepared a ‘Rearview Mirror Adapter Bolt Screw For Yamaha (8mm*8mm anti-clockwise)’, for motor’s screw is rather short. Put a video on YouTube showing how easy it is to mount and remove the drive unit on my bike. I took a more realistic test ride of 5.5 miles that included several steep hills and some wet roads. The batteries lasted for the entire trip, but they seemed to be loosing a little pep toward the end. The motor arbor is solidly attached to the motor shaft now, and the grip tape is still firmly attached to the skateboard wheel. I can’t believe we have tee shirt bike riding weather here on Christmas eve, but I’m not complaining. Hey Mike. Im so glad i found this info as i have been looking into converting my bike to be e assisted. Im going to have some questions regarding the battery as time goes on as i am not electrical savvy. Could a battery like (http://www.ebay.ca/itm/24v-10ah-lithium-Battery-E-Bike-Electric-Bicycle-Scooter-Rechargeable-Batteries-/281775651933?hash=item419b233c5d:g:eZ0AAOSwVFlT5Gat )be used for this set up? I have no experience with that brand of battery, but if the specs are truthful, and you don’t draw more then 20A, they should be fine. Provided it lets you hook your own controller and motor to it. Can you reverse the flow and charge the batteries or something else? Something like described starting at 9 minutes into this video https://www.youtube.com/watch?v=qzqJS_EJV94&ab_channel=peakmoment ? You would need to make or find a motor controller that supports regenerative braking. It is possible. Hey Mike. What did you do to take off the sprocket from the motor? Hi Steve. The sprocket is held on with a reverse threaded nut most of the time. (I.e. lefty tighty, righty loosey) The sprocket is also keyed to the shaft. This means you can grip the sprocket firmly with a vice or channel locks, then “loosen” the nut with a normal wrench by turning it to the right. Thanks Mike! I was able to do it with a channel lock! I’m indebted to you. How many volts is the motor? If it is rated for the same voltage as your battery pack, you can test it by connecting power directly from the battery pack to the motor. This bypasses the controller and throttle. Possible issues I can think of are: Bad throttle position sensor or controller, a 48v/36v motor running on a 24v battery pack pack, a 24v motor running on a 12 volt battery, or the wires for your motor and batteries are too small of a gauge to allow enough current to flow (I use 12AWG). It could be something else too, I’s need more info. Additionally, make sure your motor is rated for about 280w-300w minimum. It will not feel like even a low power moped all by itself, but it helps tremendously on hills and will increase your top speed a lot if you help out by pedaling. Hy. I am using 24v 250w 2 battery 12v 9ah the motor is working but when I drive the bike it barely moves on a straight surface seems that it’s. Not strong enough can’t speed up even with. Pedaling when I stop. Pedaling it’s losing speed it goes about. One mph on a full throttle and whit directly connected wires on the motor is the same. I disassembled the motor yesterday found broken 2 Wires on the rotor which goes to suface where the brush connect with it. (don’t know to transfer better). I don’t understand motor. Is running but not enough power? Hy again. Didn’t mentioned I am from Croatia (EU) the roller on motor is 55 mm tomorrow I am taking motor to work there’s a friend he will try to connect the wires. Hy. I replaced the motor and know it’s working fine. Thanks everybody. Very happy you got the problem solved! Have fun riding your e-bike! If we modify like this, can we fix the mudguard again ?, will be there enough sapce for fixing it ? It really depends on what mudguard you have. I’m sure you can find some way to make it work. I think your idea is totally ingenious. Very glad I found it and thank you for sharing! Hope to try to recreate once I’ve sourced the necessary parts. LiPo batteries have a higher power density. That means you can fit more Amp-hours in a given space then the older SLA batteries. You just have to make sure you charge and discharge them appropriately. Would a car battery work? Two 12volt small-car or atv/motorcycle batteries connected in series would work, though they’d be pretty inefficient because of their weight. do you have an estimate on the overall cost of this project? It depends widely on how or where you source your parts. You could find an old and used Razor E300 scooter for parts at a garage sale, eBay, Craigslist, or the like, and just get some basic hardware at your local hardware store. Otherwise, buying new “replacement” scooter parts for your build might total to around $130-$200USD. I was also wondering if you are ever going to make a list of all the needed parts to complete this project. Also if you are ever going to make more detailed instructions, or maybe a video. I don’t plan to make a step-by-step build video, but all the required parts are mentioned in the write-up above as well as in the email thread you sent me. As mentioned, among the basics, like wire, a bicycle, connectors, etc. you’ll also need a 280-300w dc motor, Razor E300 motor controller, 2x 12v scooter batteries, a 20A power switch, and a couple U-bolts and a motor arbor (sizes stated above). This is fantastic. I just bought a used e300 scooter from craigslist and took it all apart. I am now in the process of trying to fit everything to my bike… and figuring out what parts I need to order. The controller housing basically just crumbled in my hands so I don’t know if I need a new controller or not. I have motorized another bike with a gas powered motor but I can’t ride that along the beach… This ebike will be for those areas where gas is frowned upon 🙂 So excited to get this going!! Thank you to Ed Odson and Mike for the easy to follow directions. The throttle, motor, and motor controller are all from a Razor E300 scooter. In most cases, you can omit the “handle brake” connector, though you may need to short it out depending on the controller version you have. Can you use the batteries, or, essentially, the entire set-up from the razor e300 scooter parts-ed in? Or do you need to have a different battery source than it comes with for this application? You can use the stock Razor E300 SLA batteries and electronics; that’s how this whole project started. It would actually be more convenient since the Razor controller supports SLA charging. LiPo batteries on the other hand mainly give you more energy density (more power for less weight). I believe it is a reverse thread. Try holding the sprocket with a large pair of pliers or a vice (the sprocket is keyed to the shaft), and turning the nut to the right. what is the speed of the motor? The speed is directly dependent on the voltage of the motor and the amount of force being exerted on it. 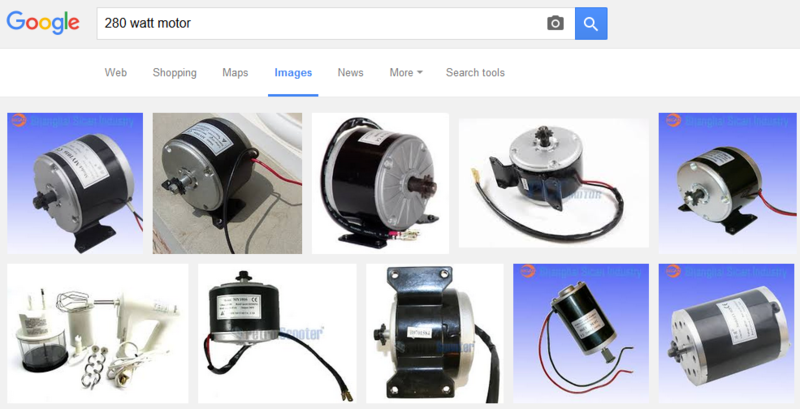 I’m not sure of the specifics, but is you search for a “24 volt 280w” motor, you’ll find the same motor I used. On my bike, the motor was able to push me up to 20mph on flat ground, that that can change with many factors however. Could you put an Amazon link to all the stuff u need. Listings are different/missing depending on your country. It’s best if you search Amazon, eBay, or outer local distributors for key phrases yourself like “24 volt 280w motor,” “2x 12v 10Ah SLA,” “Razor E300 controller/charger/throttle,” “motor arbor,” etc. Read through the post above for more specifics. Yes, the motor on this e-bike project is controlled by thumb/wrist throttle. I do however still refer it as a peddle-assist build since a 300w motor can only do so much, and peddling just a little bit on top of the motor greatly increases your range and acceleration. True peddle-assist kits, where motor speed is controlled automatically by a computer, never really caught on with me due to their lack of fine control. Understood and thank you, that is what i thought and for our needs today I think a throttle control is fine for us. Since we have a 4 wheel pedal car with both people pedaling, I’m trying to identify a few things and I’m very diligent with researching things but I honestly get confused with power/electrical things. So i’ll post a few questions and any guidance you can give is appreciated. 1. would 2 motors mounted on each rear wheel be better? The frame of the car is fairly heavy. I can lift it myself but its not a light frame and i don’t have the canopy on it yet. 2. The power items confuse me. I’m assuming i’m needing 1 or 2 48v motors. I have 2 100AH 12V deep cycle marine batteries and a pair of 100W solar panels with a 30A max charge controller. I’d love to make the canopy roof from the panels but will these batteries be of any use to me here? Hi! Thank for your usefule information. I diyed few electric bike but not satisfied. This time I was followed your diy and very satisfy with the result. Here’s my post. you can see photo’s and vedeo. do batteries need to be recharged?? This specific setup does not have regenerative braking. Charging must be done with a plug-in charger. I followed your instruction and baught 250w motor from china. but when i installed on my bike it’s very weak and bearly move my bike. I think 250w motor is weak for friction drive. and What voltage do you use? My motor is a 300w 24v motor with a ~53mm drive wheel. Make sure the wires going from your battery to the controller, and from the controller to the motor are of a reasonable gauge (12awg-8awg) and not too long. Smaller gauges will act as series resistors, wasting loads of power as heat, especially in longer lengths. Also make sure the motor’s drive wheel isn’t pushing too hard on the bike tire as this too will waste energy. A 250 watt motor is acceptable for an ebike if you intend to use it mostly in conjunction with pedaling (aka: pedal assist). hi – am I naive to think you could do this with a 12V 150W motor and just one 12V battery? If you have most of the supplies, it’s worth a shot. At the very least it might be able to assist you in pedaling. There is already a video above where I assemble the ebike. All the details you need to build one yourself are written above. Everyone’s bike and electronics part lists are different, so everyone is encouraged to use their creativity and ingenuity to work with what they have. If you have questions, just ask. I finally succeed. I got a very good result following Mike’s advice. First time I used 250w motor and it was failled it’s bearly moved my bike. So, I changed to 350w motor and I added 12AWG wire on motor to controller wire to minimize energy waste. I just went out and tested. very pleased with the result. I can run reasonable speed with no noise and I even incline hill about 25 degrees. I used bike brake wire and handle to get adequate tension. Thanks again Mike for your great post. I struggled for years to make good friction drive. I am going to try this build myself. I was just wondering about the connection that are made for the control modular. Do you have to rewrite some things, or do you basically take how the scooter is wired and replicate that onto the bike? Also how are the XT cabe and switch wired into the system. Thank you! The ebike wiring is identical to the Razor E300 scooter it all came from; switches and all. I only extended the wires to the motor with 12awg wire and replaced two pairs of the old corroded spade connectors with XT60 connectors just because I had them. I have now purchased the scooter and I am in the process of gutting it, and for putting the wheel on the axel of the motor I am struggling to take the current gear of of it. I was just wondering how you took the gear of of the motor and put the arbor mount on it. Thank you! The nut on motor is a reverse thread, turn it to the right to tighten. For attaching a skateboard wheel, I first tried to epoxy a wheel to the nut and sprocket, but that didn’t last long. I eventually found a motor arbor which has a couple set screws that firmly grip the motor shaft and any required spacers. This in turn has its own larger threads which can clamp onto a normal skateboard wheel. There are no step-by-step instructions apart from what is shown above. This is because everyone’s bike, budget, and parts already available differ. You are encouraged to use your creativity and ingenuity to make due with what’s available to you. With that being said, as stated in another comment: All the parts I used are listed in the write-up above. Some links are even given in the comments here. This whole project was based off an old, junked Razor E300 electric scooter. You can buy new “replacement” parts for the Razor E300 scooter such as the motor, controller, battreries, etc. through various places online. Just google them. You might even find some cheap deals on eBay, or even at a local garage sale. Same goes for the nuts/bolts and motor arbor. Mike, I can’t wait to dig into this project. Thanks for posting all the information. I’ve got to say…you’re one patient man for answering the same questions over and over again in the comments! You have to use a series of batteries that closely match your motor and controller’s required voltage. In most cases it’s 24volts or more. Two 12v 100Ah batteries would work, but those would be quite heavy. You really only need 1/10th of that. You also need to make sure the batteries you use can deliver the required current needed by your chosen motor. Do you conect both batteries at the same time. If you do how do you conect both at same time? The two 12v 10Ah SLA batteries are connected in series, giving me a 24v 10Ah pack. Google “series batteries” to see more details. would performance or battery’s be the same on a 3 speed as opposed to say a mountain bike? Performance shouldn’t change. In all my videos with the eBike, I’m usually in the same high-ish gear. Besides the write-up and three videos above already, the end of this video where I disassemble the eBike conversion is the closest I have to a build video. This is because everyone will have slightly (or greatly) different bikes, parts, or tools, and a single build video will not cover every person’s needs. Thanks for the tutorial, and your patience when answering questions to which the answers are in the tutorial is incredible! All the alternate names for an arbor that I can think of are “grinding wheel to electric motor adapters”, “shaft extenders”, and “buffing adapters”. I hope this helps. Hello Dave I’m also in the UK. Did you manage to find the equivalent of a “motor arbor” in the UK? I’m struggling to find one, I’m probably searching for it under the wrong name. It is a bit of a niche item. Try looking for international sellers on eBay that have the closest inch and metric bore measurements for your motor. You may need to make a split sleeve/spacer if you get an oversized one. A “motor arbor” is all I’ve ever called these things. Thanks for your reply Mike. I looked under international sellers and found one on ebay from China. I just have to wait 18 days for it to arrive. I connected everything, I measure voltage across throttle, when i turn it, but there is no power output to motor. What could be the problem? Look for a two-wire plug labeled break. It probably has thinner black and red wires. See if shorting this out with another wire or paper clip allows the motor to move. 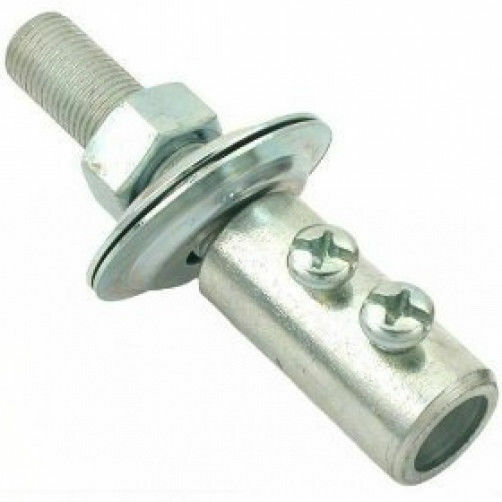 This connector normally connects to a switch in the brake handle, and prevents the user from using the motor and break at the same time. to other side of the roller and to connect it on other side of the wheel … just to be sure that the shaft of the motor won’t be damaged in long time use. And also , I notice that if you add another 12v battery (so now 36v on 24v motor) it won’t harm the motor itself . hi! good idea! How did you get the axel longer? The motor axle is unmodified. I used a motor arbor that clamps onto the motor axle, which is like another longer axle. okay, how did you do that the skate-board wheel sat still? it is bearings in my wheels. You have to remove the bearings from the skateboard wheel. hi, great job! i wanna ask you, how match kmh do the bike can ride? All the instructions, parts lists, and pictures are on this page. What is the price of this motor? About $30 to $40 in the US. Great guide, too bad i cant use that clever motor mount on my bike, but im going to build something similar. For how long do these kinds of brushed motors last and do the brushes wear down even when the motor is turned off? Will it go faster with a larger drive wheel, but with less power? Another user here mounted a similar motor to rear luggage rack on his bike. This also lets you disengage the motor from the bike’s wheel by raising your seat a bit (https://youtu.be/v2dtnP6NGkE). My motor is original to my early-generation Razor E300 scooter and is likely around 10 years old with hundreds of miles of seasonal use. As of last summer, all four carbon brushes and the commutator still looked like new (opened to inspect/re-oil bearings). The only issue I had with it was a couple years ago when one of the magnets broke free inside the casing during storage. I was able to epoxy it back in place without issue. Theoretically, your bike should go faster with a bigger drive wheel, but also have less torque. There will be a point in the curve however when there is not enough torque to overcome the air resistance at speed and move you any faster. Can I get a kit consisting of all the above parts ? No, sorry. You’ll have to source all the parts yourself and adapt the plans to match what you have. Thank you for your effort. Congrats on your results. I’m thinking 500w motor with 36v 8 Aah SLA batteries. Lots of hills where I live and I weigh 200lbs. I just want to go uphill at 8 mph. My concern is if 300w 24v won’t do it is 500w 36v a big enough increase. Also do you think the drag difference while not using the motor between 300w and 500w will be different? Thanks! Unfortunately I do not have any experience with anything above 300w. I’d give it a little more research and experimentation with what you’ve got first; its certainly worth a shot in my book. And BE CAREFUL WITH THOSE BATTERIES! The ones you linked are only capable of delivering a max of 2.4 amps according to the datasheet. For a 500w/36v setup, you’d need at least 14 amps. Hi Mike, great project. I am interested in the rear wheel friction drive concept. I can pick a working Razor e300 from craigslist for about $100. Looking at the RWD pictures and videos of some posters here, I though why to dismantling the scooter; why not use the scooter as is and use the rear wheel as a friction drive in place of the skateboard wheel? The scooter handle stem can be removed and the rest of the scooter can be fitted to the rear mounting rack using screwed clamps/hose clamps etc. just by looking at the dimensions of the scooter, the wires will reach the bike handlebar as is without any extension required. What flaws do you see in this approach? Besides looking a bit clunky, I would assume there will be some extra losses with the scooter’s chain drive when compared to the direct-drive skateboard wheel. I’d still give it a shot though if you have the resources. I have done the same as u did your project but my wheels are slipping…what should i do?? Add a layer of high strength grit/grip tape to the skateboard wheel. It might also help if you move the motor down a bit so its pushing harder on the tire. Hey, my name is Josh and I’m 14 years old and I have almost completed this build. The only thing I’m struggling with now is getting traction between the skateboard wheel and the bike wheel. Do you have and tips that can help me with this. Also thank you for posting this build. You’ll have to source the parts yourself. There are many outlets to choose; eBay, Amazon, Craigslist, etc. PLz help me i have brought battery but moter not getting plz give me website to buy motor. Search eBay for “280w 24v motor”. Hii ,I have one question ? No, the controller I use does not support regenerative braking. Which speed controller do you use? It’s a generic replacement speed controller for a Razor E300 scooter. Hi. Currently I’m doing e-bike for my design project and i have found this website which has similar ideas as i am. I am facing problem where the battery gives spark when it connected to motor directly. What supposed i do? Another question is what the other electrical components that you used for this project? The spark you see is likely due to the surge current from the motor since it’s trying to go from zero to full speed in a fraction of a second. You need a motor controller between the motor and battery to gradually adjust the speed and protect the batteries. A motor controller will also prevent the motor from getting too much current (assuming everything is rated for the same voltage). You can find e-bike and scooter motor controllers for <$20 on ebay. I used a 24v, 300w controller from a Razor E300 scooter. I used a “motor arbor”. There are a few sizes you can use; some more easy to find than others. where do you find the motor at? the motor arbor has been the achilles heel of my project since the get-go. I finally stripped the threads out of the set screw hole in my last attempt to get it tightened securely enough. Arrrg. Tapping new threads seemed like more trouble that it was worth, so I drilled a hole halfway through the motor shaft onto which the end of the set screw can seat , then put it all back together with high strength epoxy. After a year and a half my original pair of 12v 10ah SLA batteries aren’t getting me all the way to work. I replaced them with 12ah batteries, but I just couldn’t bring my self to toss the originals while they still had some life. My research on doing a parallel / serial hookup leads me to think that would be a bad idea. That would cause problems by mixing old and new batteries with different amp hours. So I just put the old pair in the battery box and I’ll switch the wires when one pair gets tired. The only problem is my battery pack now tips the scales at 30 lbs. I’ve never mixed new and old SLAs. Likewise, I’ve only ever gotten two to three years out of my SLA packs That’s mainly why I switched to lithium. If you’re using the SLA batteries that came with the scooter can you also connect them in parallel as well as in series to give you more amp hours and give you a greater range. If you have four SLA batteries, you can connect two pairs in series, and in turn wire those two pairs in parallel to get a series-parallel pack. You can not make a series-parallel pack with only tow batteries; if you tried, you’d short out both packs. I see 6S 5ah lipo packs on Hobby King for $57. Couldn’t I hook 2 of those up in parallel to get a 24v 10ah battery pack? 2nd question, what’s your experience with lipo safety? It makes me a little nervous seeing the fire videos. Obviously I’d need to get the correct charger. You can do that, but make sure both packs are nearly identical in voltage before connecting them in parallel. For LiPo safety, follow all the instructions/warnings/etc. on the labels. Common sense helps a lot too. You should also have a fuse inline with the packs just in case the motor controller sinks too much current. I’d also encourage a low voltage alarm on the LiPo balance ports. Finally, make sure nothing is poking, pinching, or heating up the LiPos when they are in their case. This is very helpful for traveling enthusiastic who want to ride on and roam around. But I have one question, ” can we make an electric bike that recharge back when emptied by paddling?” Because I think that would be great if we ran out of battery midway. And who knows if we get a little far and the mileage you mentioned can’t get us far enough. Regenerative charging does not work very well on brushed DC motors. You would have to upgrade to a brushless motor with an ESC (electronic speed controller) that supports this function. what was the size of the skateboard wheel? bought a 50mm, but hte arbor washer is about the same diameter. I used a 56mm wheel with a layer of grip tape wrapped around it. My motor arbor washers are 40mm in diameter by comparison. Would you know of any brushless motor / ESC combination with a 3S LIPO that could work as well instead of a 24 V? This is very nice and looks very fun! Does the front or back make a difference? I chose front wheel drive since it was easier to set up than rear wheel drive. Besides this, and rider preference, there is no other significant reason to use FWD or RWD on an e-bike of this class. Hi! I used your method on my wife’s 26 inch trike. I increased the batteries to 14ah due to the extra weight of the trike. Put batteries and electronics in a small plastic tool box mounted in rear basket. Bought motor, controller and throttle on eBay. Used 5/16 arbor from Grainger. The tricycle goes a lot faster than I expected it to. I’m now adding motor to my mountain style bike. Modifying your design with a bracket to attach the motor. My shock forks do not lock so I’m clamping the bracket to the lower portion of the forks with the u-bolts and then bolt the motor to to the bracket. This allows the shock action without effecting the Drive wheel to tire friction. Again mounting the batteries and controller in a small plastic tool box attached to a rear bike rack. Since my bike and my weight are a lot lighter I’m using 10ah batteries. Motor and electronics all the same as used on the trike. I’ve test fitted the motor and bracket. Appears it is going to work great. The bracket is a piece of slotted angle metal. I flattened the angle fully to mount the motor. The portion that is u-bolted to the lower fork I flattened mostly leaving a little of the angle bend to better grip the fork. The piece of angle I used is about 8″ long. That’s awesome to hear! Thanks for sharing! Keep us updated. Nice! You almost described how I modified my build to work with my mountain bike as well! Hey Mike, I’m trying to replicate your build but I’m having trouble with the attaching the arbor to the e300 motor. How did you use your spacers/bushing? I’m trying to use the bushing that comes with the motor and it just doesn’t work very well, the motor still vibrates a ton. How exactly did you get yours to attach so well? you mentioned something about cutting the spacer in a comment, how did you do that exactly? Thanks so much! I’m really excited to finish this build! If I recall, I split the bushing that comes with the motor’s sprocket in two pieces with a Dremel, then used those pieces as spacers in the arbor. I also cut a few millimeters off the open end of the arbor to allow the set screws to sit further up the motor’s axle. I believe one screw sat on the flat (or keyway) of the motor’s threaded shaft, and the other screw sat higher up on the smooth shank. I wish I could tear mine down again, but I potted the thing with Red LockTight once I had the thing running true. You may just have to find something just the right size to fabricate a spacer out of. Copper or stainless tubes perhaps? Let us know if you figure something out. I got it working! I ended up using a collet, it was a life saver, thing runs great now, I’m super happy with my build but now I’ve got the problem that the skatboard wheel is sanding down my tire tread.. ever run into that issue? I’m thinking the tire pressure and the grip tape might be the bulk of the issue. What are your thoughts Mike? Thanks again! You da man! I recommend finding a strip of high-strength grip/grit-tape. Otherwise, the skateboard wheel will slip when wet. Also, make sure you have just the right amount of downward pressure between the two wheels. Take a look at some of the pictures above for a reference. Finally, stick with normal air pressures in your bike tires; usually around 40psi. Would 2 12v lead acid batteries work? In series, yes, but only if each battery is capable of outputting enough current (at least about 15 amps continuous). I’m thinking of using your motor and skateboard wheel design on a swinging rear wheel drive design similar to a link I have seen above. Can you see any troubles if I were to just do a direct battery to motor via an on off switch design, leaving the speed controller off all together. ? My intention would be not to power and engage the motor to the tire until I’ve peddled up to speed, then power on to just maintain a good cruising speed via the motor. Am I correct in assuming that the controller adjusts the amount of volts supplied to the motor, and when it is fully on the motor is getting the full 24 volts? Also does the controller have anything to do with the charging of the batteries? If I set it up as I mentioned before I’d just directly connect the charger to the batteries. Cheers to inspiring me to make this project work on my bike. I would not recommend replacing the motor controller with a switch. This will cause a lot of arcing every time the switch makes or breaks contact. Eventually this will either fuse the contacts or create a high resistance connection that can eventually lead to a fire. It can also damage your batteries or motor from excessive current spikes. A good DC motor controller will have several features in addition to just regulating motor voltage. First, it will prevent too much current from being used, protecting and prolonging the life of the batteries and motor. A motor controller will also have battery monitoring, so it shuts off when your batteries are dangerously low, or when they are done charging. Thanks for your reply, ill definitely get a controller for my set up. I’m not real clued on with what batteries would work with this set up, but I do have a ready supply of these Panasonic batteries listed below and was thinking of using 4 in parallel and series to get me 24 volts. They say they are 7.8 amp hrs, do you think they would work? 4 strapped together fit nicely on my rear bike rack. Putting four of those SLAs in a series-parallel configuration should work, but keep in mind that a 300Watt, 24Volt motor will require 12.5Amps of current from the circuit (300W/24V-12.5A). I would keep an eye on the battery’s temperature for the first couple runs. I am gonna start making this adaptation on my bike. Before I start, I just wanted to get a bit more familiar with the electronics part, especially if I am not using the razor E300 bike parts. Is there a list of control electronics we could order and is there any footage of the electronics assembly? The videos you’ll find here are not detailed enough to get a full wiring schematic. Awesome build! I am attempting this same build but with a E200 Razor Scooter. For the most part the parts seem the same. I am having trouble disassembling the nut and sprocket from the drive shaft in order to fit an arbor adapter or something like it. Any help is greatly appreciated! thanks! It’s typically a left-hand thread. Try holding the sprocket with a pair of vice grips and “tighten” the nut. mike, this is a great project you have done. Thanks! Unfortunately, that is not something I recommend you do. A simple battery+switch+motor setup is not not going to last long, it is also a safety issue due to the possibility of fused switch contacts or overheating. Engaging the motor at any speed will cause a huge, unregulated current spike in your system that will last for at least a few seconds. Over time, that can build up enough heat to damage your batteries or motor. Similarly, without additional protection, every cycle of the switch will create an arc between its contacts that will eventually cause them to overheat, fuse, and/or go high-resistance, which will create even more heat. I hope this helps. You can get a 250-500W, 24v brushed motor controller for a scooter/bicycle for about $10 USD on eBay or Amazon. 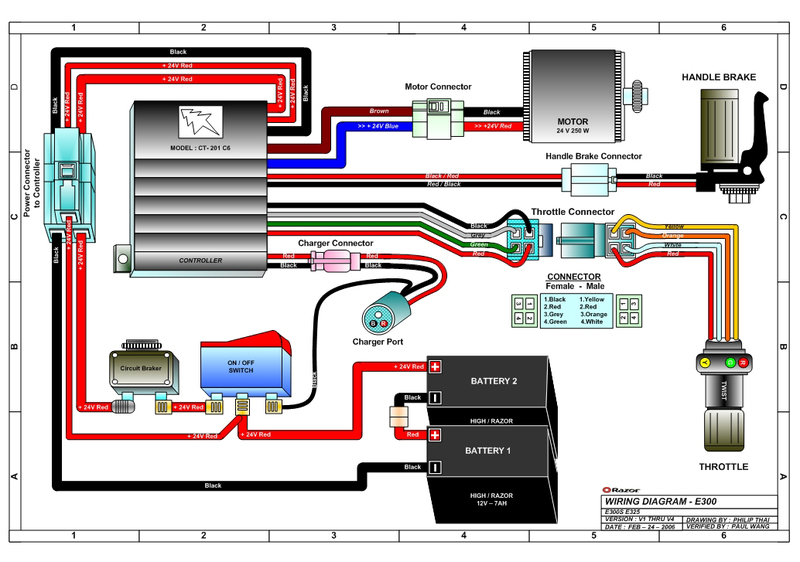 Wiring diagrams can also be found with a Google search. noted Mike, will take your recommendation on the controller. can you advise what shaft size is the E300 motor? I would like to get the exact size without any modification needed to minimise any vibration later? also, I can see from ebay that these motor arbor has right or left side threads. which ones should i get? I don’t recall the exact motor shaft size. You’ll have to measure yours, but I believe it is 10mm. You might have a hard time finding an arbor that size though, so you might have to get creative. Thread direction typically depends on which direction you want your motor to go. Ideally you’ll want it to be self-tightening (ex. left-thread for clockwise motor), but a lock nut and/or some thread locker will do just fine regardless. 2200g or about 4.85lbs with arbor. Looking closely at this set-up, looks like an amazing project. Great work ! I love it. Now inspired to make a similar installation here. Seems that the engine mounting needs some fork tubes that are above the wheel/tyre surface to mount the motor. In the example you have front-suspension forks locked out. Checking my target bike the forks are regular and seem there is limited tube above the wheel surface so I am thinking that we would not have the clearance to mount the motor in the same way. I will look into these various methods and report back as I go on. Meanwhile any similar experiences of fitting to non-suspension forks, or fitting on rear wheel, would be good information. Hello, and thanks! Elsewhere in the comments here, Ed Odson has put his motor (and electronics) on a seat post mounted luggage rack on his bike. This also lets him disengage the motor by raising the seat a little. Here are a couple of his videos: https://youtu.be/W5tDht0cULM, and https://youtu.be/v2dtnP6NGkE. Have you found some lighter and cheaper batteries for the bike, or do you still use the same big 12v batteries? I’ll typically use any reasonable 6S to 8S LiPo Pack these days since I have a few from my tricopters/drones. These require an external balance charger though. Hi Mike , I have found an easy way to attach the motor to the back wheel . Is there anyway I can upload the photos . Very easy setup …. You can just post a link to an image in the comments. Imgur, Google Drive, Dropbox, etc. Would this work better if connected by chain to back wheel? Which means i could het faster speeds with big to little sprocket etc, I was thinking of fitting on the side where disc brake is, would this motor be good for that, I was preferring to use a 12v motor if possible. Is there any 12v motors you recommend with similar or better specs as the motor you used? You can always use a chain or belt, but things will start getting really complicated with mounting, tensioning, and alignment. I don’t know of any decent 12v motors of this size. If you want one that is the same or greater power, it’ll have to draw at least 25 amps at 12 volts just to make 300 watts. This is what I did to attach to rear wheel …. Very simple easy to do . What I used was the end of a car roof rack . I attached the motor to the end support of the rack then 1 bolt holds it in place . Hope this helps others . Hello Harry, I think your solution is great. But I still have a question how did you make the skateboard roller to the motor shaft? Thank you for the information. I used a “motor arbor” to join the skateboard wheel to the motor shaft. There’s sizes and a few examples in the text above. Thanks Mike for the inspiration to get this done ….. Loving the bike have SLA batteries in series , 350w motor , gets along great ….. Thanks again …. Since last comment have added 24v 14ah lithium battery pack that someone gave to me …. The bike now is great in range and speed … Thanks again Mike …. I’m outfitting my bike with a motor for a TRON cosplay, converting my bike into a TRON light bike. Info is on my website, but I was wondering if this would be too bulky for such a sleek design. does this take up a lot of bike space? It will depend on how and where you mount the motor. By far however, the sleekest design for you would be a hub motor kit. It is a generic part made by a few manufacturers. what size skateboard wheel did you use? can you tell me skateboard wheel dimension?